On very first day of beginning of ICC Worldcup today, host Australia played with England in 2nd match at Melbourne Cricket Ground. Australia made good start by winning their 1st game by huge margins of 111c runs. AJ Finch declared man of the match for his splendid inning of 135 runs. Earlier, England won the toss and decided to bowl first. Australia putting into bat first, started inning with DA Warner and AJ Finch very agrassively. DA Warner fall down scoring 22 runs and next coming batsman SR Watson also gone for a duck on very first ball he faced. SPD Smith also failed today and got out scoring just 5 runs. Skipper GJ Bailey joined with opner AJ Finch and took charge in hand. Both played good cricket and added 146 runs for 5th wicket. 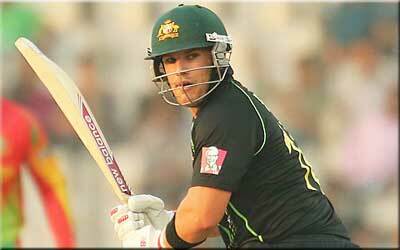 AJ Finch's remarkable inning of 135 runs were very helpful for Australia to put big score against England. AJ Finch unfortunately got run out scoring 135 runs of 128 balls. Lower batsman BJ Haddin made quick 31 runs of 14 balls and GJ Maxwell played splendid inning of 66 runs of just 40 balls and put huge score of 342 runs to achieved for England. Steven Finn (England) took hat-trick wickets on last three balls of australian inning. Following huge total of 343 runs, England could not made batter start and lost opening batsman MM Ali scoring 10 runs. Next coming batsman GS Ballance also departed early scoring same 10 runs. Skipper EJG Morgan failed and gone for a duck. Other middle order batsmen continued to lost wickets in regular interwals and England lost the match by huge margins of 111 runs. England team all out scoring 231 runs in 41.5 overs. AJ Finch declared man of the match for his 135 runs of 128 balls.